September 30, 2009  One group of Chicagoans is heading off to Copenhagen to try to win the 2016 Olympic Games for Chicago, but others are gathering in the Windy City to rally against the games. Contrary to popular opinion, some people in Chicago would rather the games go anywhere else. September 30, 2009  Former professional football players are being diagnosed with Alzheimer's and similar diseases at an alarming rate, says a study commissioned by the NFL. Head injuries have long been a concern of NFL players, and this report has put the league in a tough situation. September 30, 2009  Baseball players have something new to chew on: In the past few years, major league teams have thrown out fatty foods. At least a third of baseball clubs are recruiting nutritionists to make game day spreads healthier. Now, players are more likely to eat baby carrots than a Baby Ruth. September 28, 2009  The Detroit Lions beat the Washington Redskins over the weekend, snapping a 19-game losing streak. Theo "Gridiron" Spight, who leads the Detroit Lions' fight song, Gridiron Heroes, at every home game, says he was so excited after the win, he almost forgot to sing the fight song. September 28, 2009  The International Olympic Committee meets this week to select the site for the 2016 Summer Games, and President Obama will make a personal pitch for his hometown. The city had already planned to send a star-studded delegation that includes first lady Michelle Obama and Oprah Winfrey. September 26, 2009  The Yankees won the first in a three-game series against the Red Sox last night, 9 to 5. But who cares who won? The Yankees have already clinched a spot in the playoffs. Host Scott Simon talks to NPR Sports Correspondent Tom Goldman about last night's matchup between the Yankees and the Red Sox and the goings-on in the NFL. September 25, 2009  Russian tycoon Mikhail Prokhorov has agreed to buy a controlling interest in the New Jersey Nets basketball team. Sportswriter Stefan Fatsis says the NBA has to vet Prokhorov's bid, but his 2007 arrest at a French ski resort in connection with ferrying in prostitutes is likely to be the main red flag. Prokhorov was not charged for that incident. September 25, 2009  With one week to go until the International Olympic Committee selects the host city for the 2016 games, Chicago is hoping star power in the form of Oprah Winfrey and one of the Obamas will boost its bid. But how would hosting the Olympics really benefit the city that wins the competition? September 24, 2009  Twenty-five year ago, tennis player Vicki Nelson-Dunbar played Jean Hepner in a 29-minute, 643-shot rally. The rally remains the longest point played in a professional tennis match. Nelson-Dunbar says the two-set match lasted 61/2 hours. She says other points in the game could have been longer. September 24, 2009  Bode Miller announced his skiing and Olympic plans at a news conference in Los Angeles on Thursday. Miller quit the U.S. Ski Team two years ago and formed his own ski training team. September 23, 2009  At 27, Serena Williams has won every major title in tennis — but she made headlines this year for her bad behavior at the U.S. Open. In her new book, On The Line, Williams describes her life in the sport. In an interview, she discusses that infamous match — and playing against her sister. 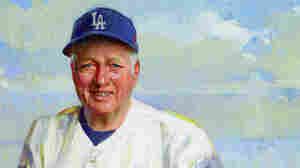 September 22, 2009  A life-size portrait of former Los Angeles Dodgers manager Tommy Lasorda was unveiled at the National Portrait Gallery in Washington, D.C., on Tuesday — his 82nd birthday. Lasorda tells NPR he never reached the level he thought he would reach as a player.